I have this routine. Every other oil change, I take my car back to Sears to have the tires rotated. Car maintenance has been imprinted upon me since I was 3 or 4 years old and my dad would put his green Dodge Charger (the same model used in The Dukes of Hazzard ; I called it “the pickle car” on account of its color) on risers and change the oil himself. But rather than driving 10 minutes to the Sears Auto Center at Willowbrook Mall—where I could pass the time browsing and shopping in climate-controlled comfort or selecting from the bountiful variety of food court options—I double that and trek 20 minutes east to the Hackensack Sears. Once I’ve handed over the keys and the mileage tally, the counter employee asks if I’ll be waiting for the car. “I’m going to get some lunch, then I’ll be back,” I answer before heading across the huge parking lot toward the art-deco department store… and right past it, down River Street. 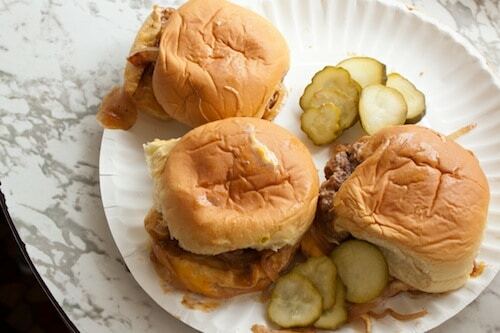 Whether in a cold November rain or a hot-town summer in the city, I’ll walk half a mile past loading docks and car dealerships just to cozy up to the counter at White Manna (358 River St., Hackensack NJ; 201-342-0914) for a paper plate laden with four sliders and a pile of pickles, plus a cardboard canoe of krinkle-cut fries and a cold Coke on the side. The timing is everything. 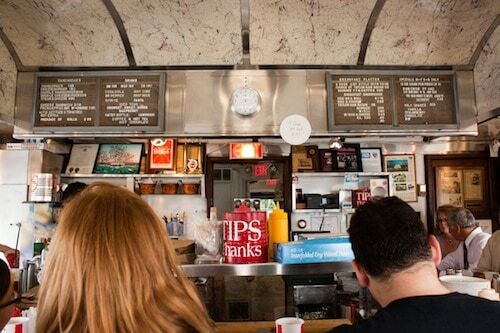 I leave my house no later than 11:15 am to ensure I walk into White Manna before noon, increasing my chances of getting a stool at the counter before the lunchtime rush. In at least a dozen visits over seven-plus years, I’ve not yet been forced to consider alternative plans, which might be limited to getting everything to go and finding a picnic spot along the foul and decidedly urban stretch of the Hackensack River running past the back door. I don’t think the manager at the McDonald’s across the street would let me borrow a table. But it wouldn’t be the same if I couldn’t eat inside the building smaller than my living room. I don’t go just for the food. 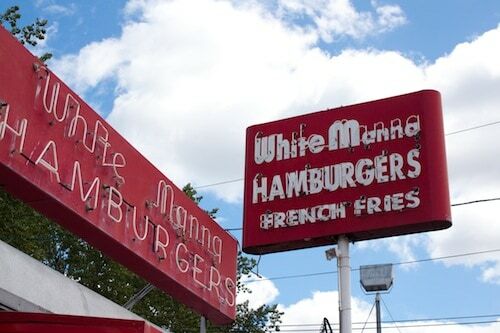 While White Manna ranks among my top five burgers in northern New Jersey (and may get pushed to No. 6 when Shake Shack opens in Paramus next month), I don’t think it would hold up in a neutral-site taste test with Elevation Burger, Egan & Sons in Montclair, Bucu Burger in Paramus, or even Bobby’s Burger Palace (say what you will about Mr. Flay and his chain, but it’s got some tasty offerings). 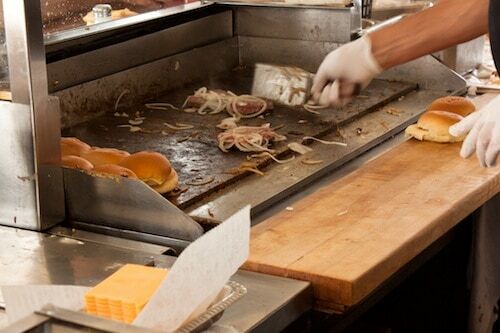 White Manna’s burgers aren’t much more than bland golf balls (or baseballs, if you order a double) of beef slapped on a griddle, but when combined with a pile of sautéed onions, a square of American cheese, and a Martin’s potato bun, they create a flavor that’s hard to match. 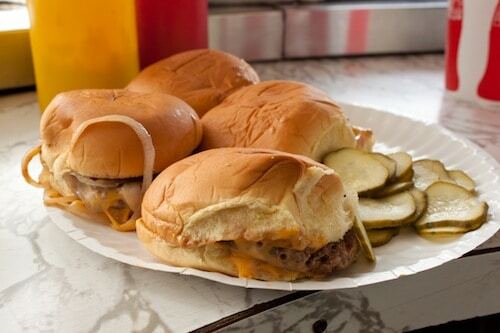 I’ve ordered sliders at other restaurants, bars, and pubs, but very few of them measure up to the basic pleasure of those in Hackensack. Maybe it’s the too-hard buns at the other places or maybe they’re too flavorful. Sliders, to me, are supposed to be simple. That statement often comes off as a cold, gruff response, but it’s not so much the cook’s personality as it is her concentration. Lined in front of her are two to three dozen burgers in various stages of cooking. She doesn’t write down a single order. When I order four cheeseburgers—two with onions and two without—she puts four patties down on the right-hand side of the griddle, adds onions to two of them, and then takes the next order. As burgers come off at the other end, those that started on the right are flipped toward the left, where the cheese and buns are added. Whether the order is for two doubles, four cheeseburgers, or some combination of singles, doubles, cheese, no cheese, onions or no onions, she’s got it all in her head, and she knows whose order is up when they reach the end of the griddle. Only once has the cook on duty gotten my order wrong, and it was because she thought I said five instead of four. I didn’t complain; I enjoyed a bite or two of the extra burger and paid the extra $1.50. Of course, there is a penalty for such indulgence: I walk out of there fully aware of my gluttony. But it’s a treat I give myself twice a year to turn a mundane and necessary task (that keeps a 200,000-mile car running smoothly) into something to anticipate instead of dread. When the weather allows, I’ll follow the bank of the river on a path through nearby Johnson Park, turning the walk back to Sears into nearly a mile. Plus, I get to smirk at the people heading to McDonald’s as I leave White Manna and at those in the Burger King drive-thru near the end of my trek. Do they not know? Do they not care? Do they not have the time in our too-fast, right-now, I-want-it-my-way world? 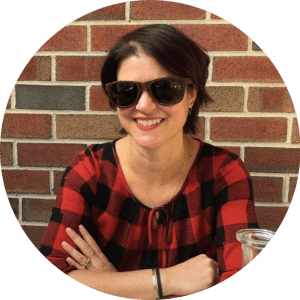 By the time I walk up the sloped parking lot toward the auto center showroom, I often see my car outside, holding five fresh quarts of oil and with all four tires in different spots—and a resolved issue or two that forces me to hand over the credit card. But after such a tasty, economical, and satisfying lunch, I can’t complain; it’s a small price to pay for such simple happiness. Dan Cichalski is a writer and editor who can tell you the name of every single major league baseball player who went to Notre Dame. He works night hours, so he sometimes has burgers for breakfast. He would eat a lot more of them if his wife allowed it.